It has certainly been a while between posts, but I thought I write a few things about my conversion to Kicad as my EDA of choice. Most All of my projects in the past I’ve use Eagle PCB, as it certainly has been the EDA of choice in the open hardware community. However it was the only non-open piece in my open hardware arsenal, until now…..enter Kicad. I’ve been keeping an eye on Kicad for the past couple of years and I’ve never really had time to try it out on a project until now. My Father is a member of a recreational collectors motor bike club and they have a number of timed competition rallies throughout the year that may go over the weekend and consist of many checkpoints across a course that are located throughout the district. In the past they did everything manually i.e. write down their time and details at each checkpoint, so at the end of the rally, times are tallied and winners announced etc. Since it is manual it doesn’t scale very well, at their annual run where a few hundred competitors took part it didn’t scale well at all. Knowing the geek that I am, my father asked me if I could do anything to make things simpler. The club had investigated some commercial rally systems, but was pretty expensive. I volunteered to automate things a bit….. Enter RallyLog! An Open Hardware project that will use RFID tags to log competitor times at checkpoints. So I now had the reason to learn Kicad for a totally Open Project. eeschema – the schematic editor. cvpcb – the footprint selector for components used in the circuit design. pcbnew – the PCB layout program. gerbview – the Gerber (photoplotter documents) viewer. Coming from Eagle I had to unlearn how I did things within Eagle and move to the Kicad way, this means a lot of right-clicking to do things, many things were not the same as what I was used to in Eagle, but I quickly picked things up within a day of using Kicad and now find most things fairly intuitive. If I had a problem I found the developers and the users to be very helpful answering questions on the mailing list. What About Your Existing Libraries? Yes this is a big thing, especially those who have build up their own footprint libraries over time, however all is not lost! a ULP Eagle Library conversion script has been written that is run from within the Eagle Library. This converts the library to the Kicad library format of which the Components and PCB prints are separated out into two files. One is a library *.lib file for eeschema that contains the schematic representation of the components, the other is in a *.mod format for module footprints used within pcbnew. Device – the PCB footprint , all of which represent a component. Kicad component library has been separated into the Schematic and the PCB side of thins, one library for each. Now That I’ve been using things for a bit over a month I can see that it makes a lot of sense. When I’m creating a schematic all I want to worry about is capturing the circuit, if I need a new component I create a new component in the library, not having to worry about the footprint at this point in time. In eagle it is similar, i.e. you can create only the symbol and package without the device, but I found it long winded. Another added bonus with the components is you can link data sheets to the individual components. Brilliant! I successfully imported a my libraries across, I did have to manually replace the reference some components as it defaulted to U? One thing I haven’t played around with yet is the 3D viewer. view with the built in gerber viewer. Interface for FreeRoute build into pcbnew, so you can use a push and shove autorouter. 3D Viewer of the PCB. 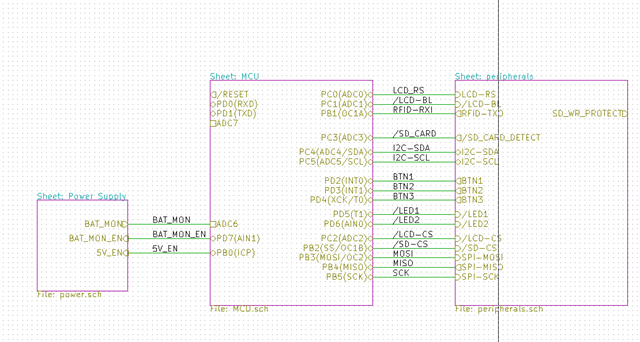 I love the professional looking schematics it generates, even including the border information. Drills – Kicad has no concept of drills or holes in the pcbnew program, so you have to put in a pad that has the drill and the pad size the same, unfortunately this results in plated holes unless you notify your manufacturer of the holes not to be plated. Lack of inbuilt scripting like eagle, however you can write scrips in any language you want and manipulate your schematics, PCB and components externally du to the open format it is all saved in.